Chef Heather Earnhardt's super-creamy clam-chowder recipe is one of the best, whether it's made with the Pacific Northwest delicacy known as razor clams or whatever kind you have on hand. The best way to eat razor clams, as everyone including Earnhardt agrees, is right away, just cleaned, dredged lightly in flour and fried in butter. But razor-clam chowder is a special treat, the delicate clams lending a bouncy texture and a perfectly light oceanic flavor. Earnhardt’s recipe — which she’ll include in a new Tokeland Hotel cookbook when she finds the time to put it together — starts, propitiously, with frying bacon in a half-stick of butter. The celery and shallot get cooked only briefly, maintaining a little crunchy life in the chowder. Don’t chop the clams too fine; you don’t want them to get lost. 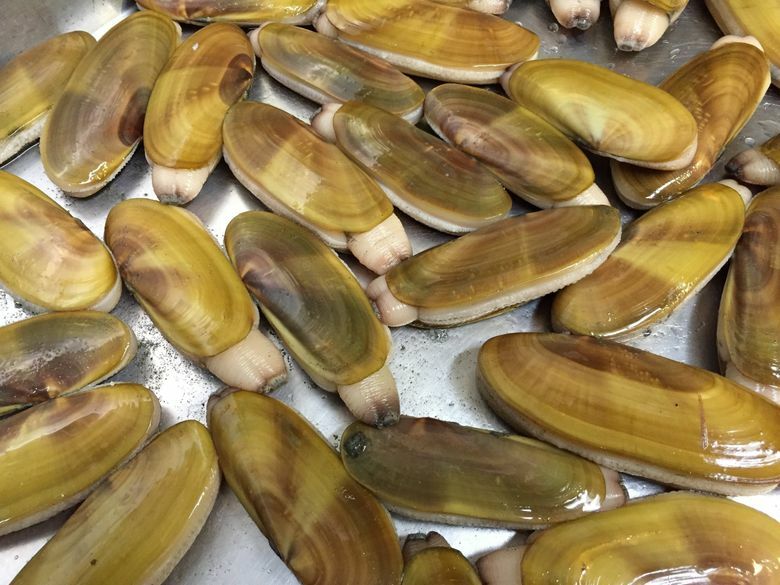 If you can’t go dig your own razor clams (or go eat chowder at the Tokeland Hotel), you can get them frozen from Alaska at Pike Place Fish Market (where they throw the fish), both on-site and online; Uwajimaya stocks frozen ones, too. This chowder would also be very fine made with regular Manila clams. Serve it with crackers or bread, with an extra pat of butter melting on top of each bowl. 1. Boil potatoes, quartered, for 10 minutes until just tender. Rinse in cold water to cool, then dice. 2. Melt butter, add bacon and cook until almost crispy over medium heat. 3. Add celery and shallots, sprinkle with salt and pepper, and cook, stirring frequently, until they just start to soften (about 3 to 4 minutes). 4. Add flour and stir until white color has cooked off (about 1 minute). 5. Add white wine and stir for 1 minute. 6. Add half-and-half, then about ¼ cup clam juice, while stirring constantly. 7. Add lemon zest, squeeze of lemon juice, thyme bundle, and Worcestershire and hot sauce. 8. Cook until starting to thicken, stirring often — don’t let it scorch. 9. Add as much of the diced potatoes as you like (maybe about 1½ cups) and the clams, then stir in the rest of the clam juice as the chowder (quickly) gets thicker. 10. Cook for a few minutes, stirring, then turn heat to low and taste. Season with salt, pepper and more Worcestershire and hot sauce, stirring in a little at a time while tasting — it will want about a teaspoon of salt and up to 2 teaspoons each of additional Worcestershire and hot sauce. 11. Serve sprinkled with extra thyme leaves and a pat of butter melting on top.